The ESH group at Brown maintains four isotope ratios mass spectrometers for analyzing the isotopic composition of bulk organic matter, organic compounds, snow, ice, water, and inorganic carbonates. Our mass spectrometry facilities are among the best. The MAT 252 / Kiel III Carbonate Device is dominantly used for inorganic carbonates and is available for internal and external users. This instrument replaced our SIRA-24 on which we processed over 90,000 samples between 1983 and 2000. The MAT 252 is capable of processing 46 samples (including standards) in approximately 26 hours. All analyses are reduced and reported relative to VPDB by calibration to NBS19 reference material. In addition to NBS19 we run two dry lab standards, BYM (Brown Yule Marble) and Carrara Marble. Our long-term analyses of these standards (between 25 and 100 micrograms CaCO3) indicate a routine precision of better than ±0.03 ‰ (1s) for carbon and ±0.06 ‰ (1s) for oxygen. Both generate reference gas sufficiently close in isotopic composition to the samples typically run in the lab. Reference gas generation requires ~5 grams of calcium carbonate per liter of gas. We typically use the coarse fraction (> 150 microns) from carbonate-rich Pleistocene deep-sea sediments or a fine grained marble as reference gas material. 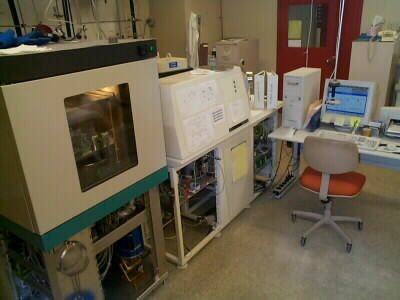 Both generate reference gas sufficiently close in isotopic composition to the marine samples typically run in the lab. 50 to 80 micrograms of clean CaCO3 is sufficient for a typical analysis, although small samples on the order of 12-20 micrograms (single foraminifers) can also be analylized. Foraminifer samples should be submitted (already cleaned) in 1- or 4-hole micropaleontology slides with one sample per hole. Please use different holes for each species (do not place multiple species from a single sample in the same hole). Each hole/sample should be labeled with the full core and sample identification, genus and species identification, size fraction, and the # of individuals. For Ocean Drilling Program samples, the full core sample ID includes the Site, Hole, Core, Core-type, Section and Section Depth in cm. Sample presentation other than 1- and 4-hole slides are also acceptable provided that each sample is appropriately identified as above. The per sample rate for outside users is $14 per sample. The name and contact information of the principal investigator as well as a purchase order number must accompany submitted samples.